"Don't go crazy, be cool." Director Kiyoshi Kurosawa is one of the hottest Japanese directors working today. Kurosawa (no relation to the legendary Akira Kurosawa) is behind the modern masterpieces Cure and Pulse, which are heavy on psychological terror and suspense. Kurosawa's has a style all his own, as he favors atmosphere over actual on-screen action and cheap jump scares. While some moviegoers might be frustrated by the fact that a Kurosawa film almost requires multiple viewings, the effectiveness and power of the messages he's delivering make this extra viewing effort more than worthwhile. 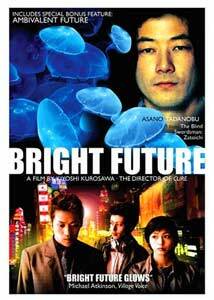 2003 was a very busy year for the director, as both Doppelganger and this film, Bright Future, were released in Japanese theaters. Doppelganger finally received a domestic DVD release a few weeks ago, and now the same can be said for Bright Future, which is simply a brilliant, flawless effort. Bright Future begins with best friends Yuji and Mamoru getting through their rather meaningless lives with nothing really exciting going on around them. Mamoru is the more unstable of the two, and one day gives Yuji his pet jellyfish, which means more to him than anything. Soon after this gift-giving, Mamoru commits a horrendous crime and winds up in prison. Yuji visits Mamoru quite frequently in jail, and eventually runs into Mamoru's father, Shin-Ichiro (Tatsuya Fuji, whom you might recognize as the star of the infamous 1976 film, In the Realm of the Senses). After the story's second big shocker of a twist, Yuji moves in with Shin-Ichiro, bringing Mamoru's pet jellyfish with him. Even though much of the action has basically taken place by this point in the film, it's here where Bright Future really takes off and becomes masterful. Upon moving in with Shin-Ichiro, Yuji basically begins preparing the jellyfish for what could amount to be an act of terrorism upon the people of Japan. What happens near the end of the film is left to interpretation as to the actual level of danger that Yuji (and Shin-Ichiro, to some extent) inflicts or intends to inflict upon his countrymen. However, Kurosawa's true genius comes out of the way that he handles the unlikely relationship that develops between Yuji and Shin-Ichiro. It could be that Yuji is using Shin-Ichiro as an accomplice to his jellyfish scheme, but it's more likely that Yuji sees his new friend as a surrogate Mamoru. Therein lies the true brilliance of Kurosawa's film. He could have easily just made a confusing, slow, muddled mess of a film that told a straightforward but boring story. Instead, he taps into David Lynch territory and does him one better. Kurosawa makes Bright Future a heart-warming horror film that is one of the saddest, thought-provoking, and human films to come along in quite some time. Bright Future finally gets a domestic DVD release that does justice to the film's look and sound. There aren't a bunch of extras here, but the documentary is a great addition. Image Transfer Review: Bright Future appears in its original aspect ratio, and looks quite good. Kurosawa shot the film on DV, and uses quite a few tricks and strange camera angles, but the overall quality of the video holds up throughout. The inherent grain of this format is present, but kept to a minimum, and the muted color scheme looks pretty good. Audio Transfer Review: The only audio available is a Dolby Digital 2.0 mix, but this is surprisingly lively when it needs to be. Kiyoshi Kurosawa uses many strange noises and hissing sounds to create an atmosphere of dread during the film's dark moments, and these are effectively conveyed from the rear speakers, enveloping the listener in the overall experience. There's a bit of bass presence too, and the dialogue is clear at all times. 2 Other Trailer(s) featuring Reconstruction, DIG! Extras Review: Aside from trailers for Bright Future and other Palm Pictures releases, the main extra is the hour-plus documentary, Ambivalent Future. This extraordinary film chronicles the making of Bright Future by using the perfect combination of interviews (mostly with the cast and director Kiyoshi Kurosawa) and on-set footage of this fittingly complex shoot. Bright Future can be a struggle to get through, but the payoff is priceless for those who make it. This chilling, thought-provoking masterpiece will keep your brain churning for hours after the end credits roll.